Barn No. 28 was a tasty affair, and guests celebrated the brand’s 40th anniversary with delicious barbecue from Bad Brad’s BBQ. Chefs from Meijer stores – a Certified Angus Beef ® brand partner – were also in attendance to prepare a delectable lunch for brand partners and Singletree guests. The group also toured the farm. The best place to learn about beef is in the pasture. 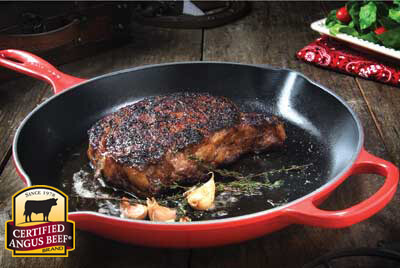 And the Certified Angus Beef ® brand is outstanding in the field. Gene and Kris Bellingar and Evan and Grace Boehmer of Singletree Farms have been raising Angus cattle in Charlotte, Mich., since 2009. Evan and Grace are second-generation farmers, and a third generation will arrive soon! It didn’t seem to bother Evan, and now he and wife, Grace, are excited to have the Certified Angus Beef ® brand painted on the family’s barn to showcase their high-quality Angus beef. The couple is also thrilled to be first-time parents. Singletree Farms is growing in more ways than one!